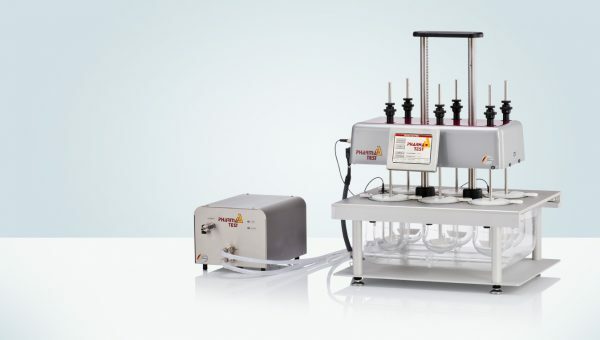 The PT-SP multi-syringe pump is designed specifically for parallel sample withdrawal and dosage of media from a dissolution bath into open vials inside a fraction collector. It is equipped with up to 8 replaceable 10ml high precision glass syringes. 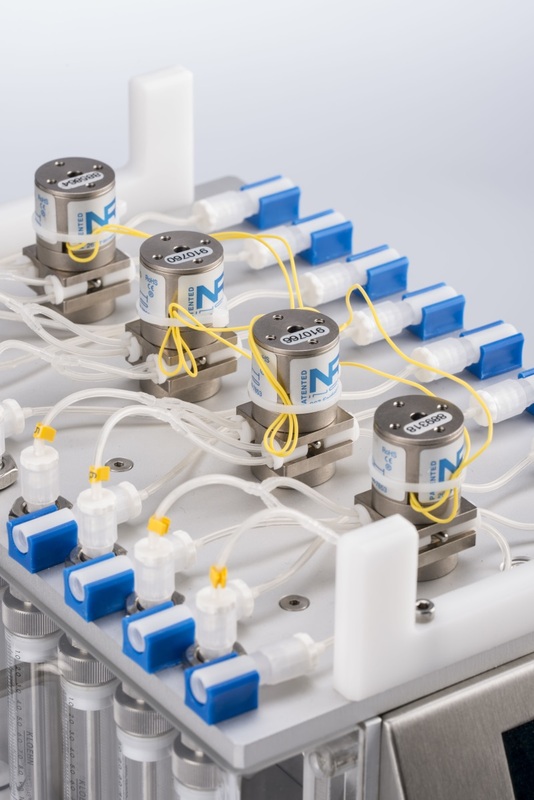 Each syringe is connected to a 3-way pinch valve for media flow control. 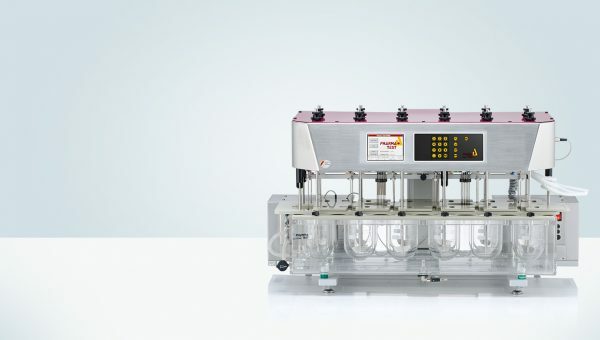 The drive of the syringes is carried out simultaneously by a stepper motor. All syringes are rigidly connected to the common sturdy drive bar. The high resolution of the steps for a full stroke ensures a high accuracy of dosing and sampling. 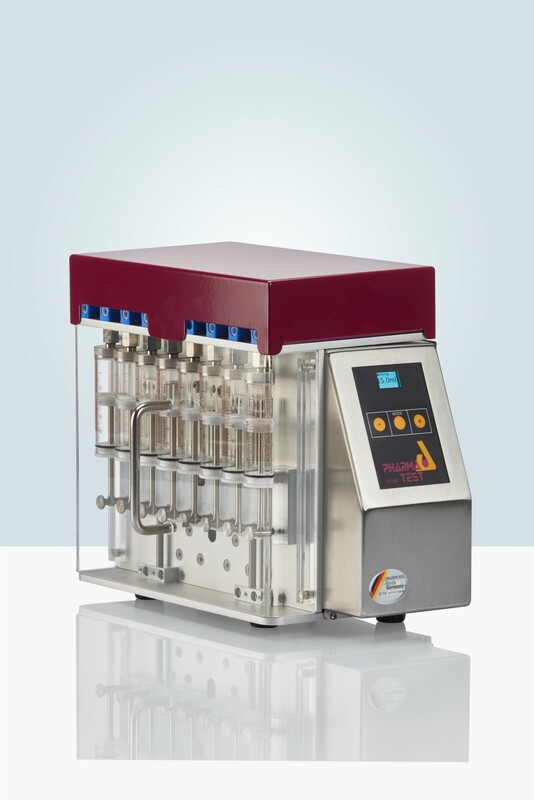 Depending on the tube dimensions and the volume to be dosed, the sampling and dosing rate can be adjusted. The complete cycle for a withdrawal of the sample medium and emptying of all tubes and syringes is fixed. First, the hose lines are filled, drained back into the reservoir and then refilled. 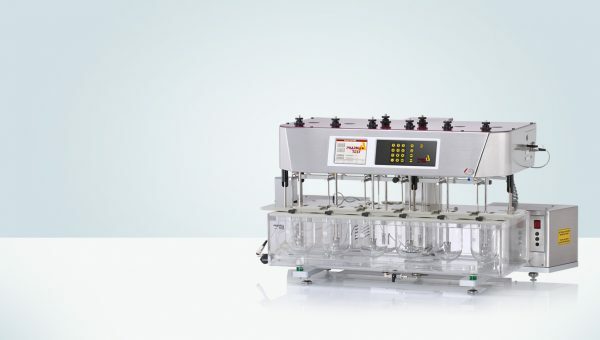 This ensures an equal concentration of media inside the tubes, syringes and vessels. The withdrawal cycle that takes place depends on the volume to be sampled and will be done in either one or two steps. This is determined automatically by the programming of the PT-SP according to the volume of the syringes. A second PT-SP multi-syringe pump is used as the media refilling pump. It is connected to the master PT-SP pump and automatically triggered by the master pump to refill the programmed volume. This way the refilling pump starts automatically once a complete sampling sequence is finished. It is also possible to link together two PT-SP pumps, to increase the number of sampling lines. The PT-SP is available as a six syringe model (PT-SP6) and as an eight syringe model (PT-SP8). Both models can be freely combined to produce any number of sampling lines (e.g. 6, 8, 12, 14, 16). The refill pumps can be added and combined in the same manner. Calibration data is stored on each individual pump. The runtime parameters have to be entered only once on the master PT-SP. This pump automatically shares these settings with the other connected pumps and triggers there as soon as they have to start their operation. 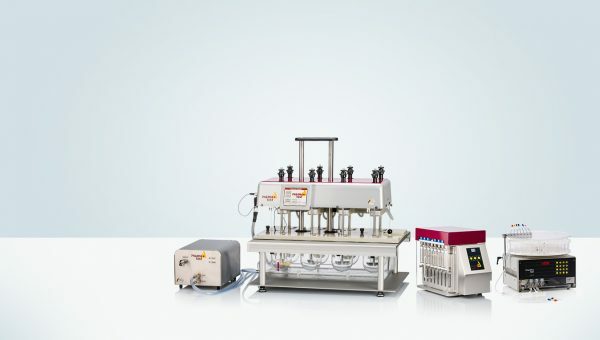 The sampling time information is set-up as a testing method using the method filing program of the connected PTWS dissolution bath. This includes also the EPE sampling probe control for the required immersion depth and dispensing time inside the dissolution media. Sampling volume and speed are set using the entry keys of the PT-SP. The data is filed and can be recalled at any time. Prior to the start of a run the operator enters product information such as a batch or lot number to the test information within the menu of the connected PTWS dissolution bath. The tablets are dropped simultaneously using a manual TM or automated TMA tablet drop magazine (available for PTWS 820D, PTWS 620, PTWS 1220, PTWS D620 and PT-DT70 (only manual TM available) instruments). Sampling & Dispensing Speed Minimum 0.50ml/min.